Seva Wellness is a massage therapy clinic specialized in physiotherapy, chiropractic, and acupuncture. We have been in the field of health and wellness more than two years providing our valuable services to people in Surrey and surrounding areas. Starting as registered massage therapy in Surrey, we now have been able to spread our wings into the areas such as physiotherapy, chiropractic, active rehab, massage therapy, acupuncture, sports therapy and kinesiology. Our well-trained physiotherapists at Seva Wellness Clinic Surrey demonstrate their high skills during their treatments in the most effective manner. They use the most effective treatment strategies to reconstruct the function and movement patterns of your body. It will be such as relief to know that registered massage therapists, registered physiotherapists and other licensed practitioners at Seva Wellness Clinic Surrey are recognized for their ability to treat the patients. Therefore, without a doubt, our massage therapy clinic will be the biggest surprise for you, and it would be the beacon light that you were waiting to see to restore both your physical and mental needs. As we have a sweet-tempered staff, they will be incredible support in active rehab to triumph your challenge of eradicating addictions as well as they are capable of attending personally in exceptional cases. Kinesiology at Seva Wellness draws attention, as it is where you find the latest medical remedies used in practice. With the sweetly tempered staff members and their full support in our active rehab, Your body can now turn into the shape that you have been dreaming about. Kinesiologists in our Surrey clinic have a good understanding of human movements, and they will immensely help in terms of rehabilitating your body and rebuilding new muscles. As they are really professional at their kinesiology sessions, you can even talk to them about your private matters to get more assistance on your health and wellness. Seva Wellness Clinic Surrey is the place where you meet skillful sports therapists to cure your sports wounds regardless of the patient is professional or an ordinary player. Our rehabilitation programs will also offer you with a list of proper principles to achieve your goals. Seva Wellness Clinic is the ultimate multidisciplinary clinic you can visit to rehabilitate and maintain your health and wellness. With the utmost reliability, recognition, high-standard and modern technology, we have been able to provide outstanding services for our patients in the Surrey area. Visit Seva Wellness Today, and let us exceed your expectations with our professional services. 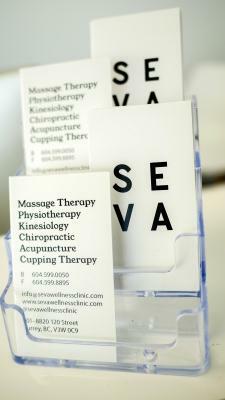 We are the Seva Wellness Clinic in Surrey. We are a multidisciplinary clinic and we provide different services. We have a few registered massage therapists working with us to provide the best services you need. And we are highly respectable in front of your body needs. Our mission is to provide you with safe, effective healthcare with the very highest level of customer service under the guidance of registered massage therapists. In order to fulfill our mission, we implement advanced technical resources and our human resources. Our registered massage therapists are fully accomplished with the knowledge related to massage therapies. Within the last few years, we have proven that our clinic that our clinic has the ideal massage therapies for your body needs. Our clinic is a multi-disciplinary clinic where we are working together with the excellent physiotherapists, kinesiologists, chiropractors, and acupuncturists. Therefore we promise that our chiropractic massage, kinesiology therapy, physiotherapy massage, and acupuncture services are always at the highest quality and authentic massage therapies in Surrey. Even our registered massage therapists are highly consummate and qualified in sports and remedial massages. So we are directing a pain clinic under the guidelines of our registered massage therapists. Seva Wellness Clinic is ready to indulge with every attention regarding out top-notch services with the expert registered massage therapists. The registered massage therapists under our company possess an outstanding understanding regarding the imbalances of your body and sports injuries. Therefore they know what is best for the healing process according to your health conditions. We are holding the title of best-registered massage therapists in Surrey. Feel free to visit the best massage therapy Surrey and we are more than happy to provide you with the best service.